Sometimes, it can be tough to find inspiration when you're seeking a unique, memorable yet affordable gift to bestow upon a loved one for a birthday, anniversary, or any similar sort of occasion. That's right, the Serenity flower and chocolates gift bundle is just the affordable yet spellbinding present you're looking for. OK, so we've covered the flowers, what else does the Serenity gift bundle include, we hear you eagerly demand. Dear reader, it includes chocolates; no less than 96 grams of the Thornton's finest Premium Collection chocolates. As a result, not only is this a visually stunning gift, it's also delicious too, a multi-sensory delight! Every order comes with a free personalised gift message which you can upgrade to a splendid handwritten card for a mere £2.95 extra. 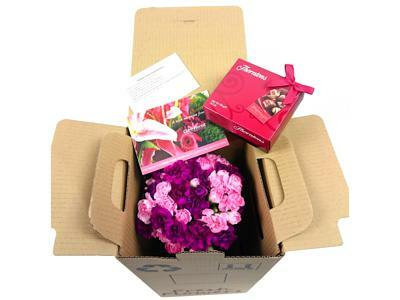 Whatever the occasion is, the Serenity Spray Carnations gift bundle is destined to make an immensely favourable impression on anyone lucky enough to receive it.